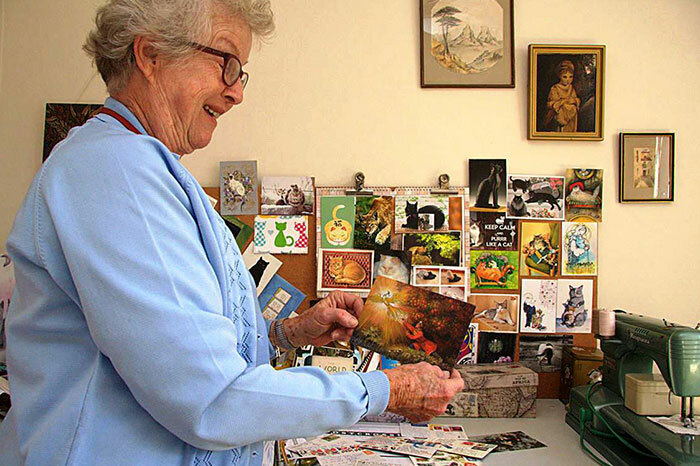 Blog > Postcrossing Spotlight: alison41 from South Africa! Meet Alison (aka alison41) from Cape Town in South Africa . She’s a very enthusiastic postcrosser in her country, and a fan of books, writing, and mahjong! She has sent us quite a few interesting postal-themed articles over the years, and regularly updates us on the postal situation in her country… so we thought it was time we got to know her a little better. Here she is! A local magazine “IDEAS”, featured a 2 page article with pictures, about Postcrossing — at the sight of the international stamps and Par Avion stickers, I was immediately interested! I love receiving mail. I’ve been a letter writer my entire life, and had literally dozens of penfriends over the years. I still have one or two, particularly an Australian lady, we still correspond — by now it has been nearly 50 years. Apart from being an avid reader, and writing articles for my two blogs (Despatches from Timbuktu and The Booksmith) my other passion is playing Mah Jong. I have been playing the game for nearly 50 years. I learned in Rhodesia, during the early 1970s, and have been playing, and teaching others how to play, ever since. I run a small club in the retirement village where live. I found a couple of Asian themed cards to display next to my Mah Jong set. Reading the biographies of the people to whom I’m about to send a card. As a writer, I find people and their lives intensely interesting. So I enjoy reading everyone’s profiles, because here you have insight into their personalities, likes and dislikes. 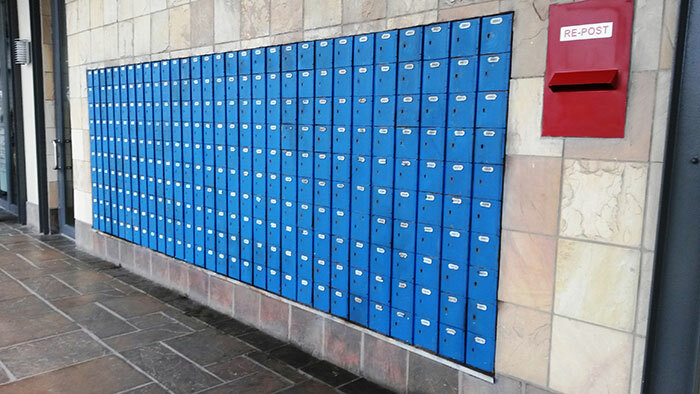 Blue mailboxes and the red outgoing box at the Big Bay Post Office. The view from the post office balcony cross the bay to Table Mountain is stunning! I love my cat-themed postcards, and have displayed some of my current favourites in front of my work table, so can see and enjoy them daily. I am a huge cat fan! But apart from my Cat Cards, I’m involved with Gonny in the Netherlands, and we have our own “story card” project, inspired by a post on this blog from September 2017 titled “Postcard Stories”, about a woman who published a book consisting entirely of stories written on postcards. I don’t think we’ll produce our own book, but we’re having a lot of fun! Mexico! If you live in South Africa, then Mexico is a very far way foreign country; ditto Iceland and Greenland. Regrettably not; South Africa has very few members, and it is a big country. I’d love to attend a local Postcrossing get-together… but I think for that to happen, I’ll have to organise it myself! What else excites me? Going to the theatre; book sales; cats; current affairs; books and reading; my monthly writing group; attending monthly meetings of the University of Third Age – the speakers are usually professional people who come and speak about their field of expertise. I run a monthly Book Club meeting at the local library and I’m always delighted to meet other readers and chat about books. Hi Alison, Nazlie Dalwai here , also from Cape Town. My story is far from interesting like yours but are also very keen for a get together. My friend that introduced me, stays close to you, Mickey van Driel and maybe you can contact her and we could arrange one. I agree with you onm the view of Table Mountain. There's nothing that beats that. Hi Alison, you are very inspiring, so many hobbies! Wonderful blog. 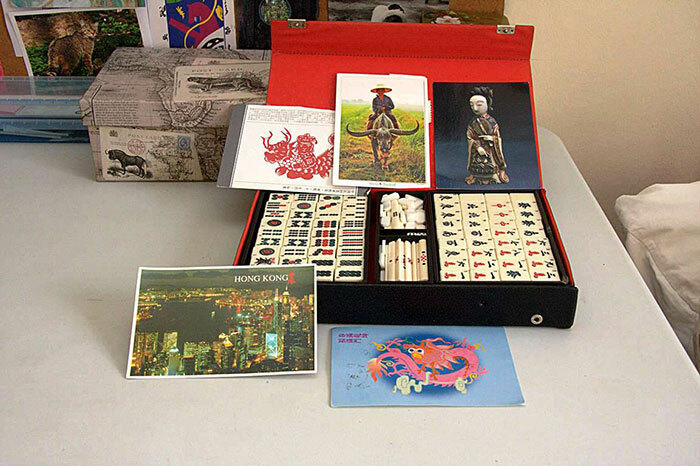 It is a really interesting idea to write a book from stories on postcards. I hope that someday I will receive your address for exchange. My postcrossing story will be interesting. Best wishes from Russia!!! I admire Alison. It's great to spend your time like this and be such a cheerful person. With best wishes from Moscow region, Russia, Evgeniya. Lovely to get to know you Postcrossing Friend! What a beautiful hobby we have !! Hello Alison,great story. I know Gonny aswell we write story cards to each other very funny and inspiring hobby. Best wishes to you enjoy live take care and a lot of fun by writing postcards ciao from Italy. Hi Alison! What a great setup you have, postcards and a sewing machine...my dream! I enjoyed your interview so much and I hope someday I get your name for exchange. Hug's from Janet in the U.S.A.
and nice to see pictures of you ! I even have a great continuing story ! Lovely interview. I am also a fan of U3A here. A delightful story, thanks for sharing. Alison you look so much like my own Mum! I have for you nice card!write me your adress!!! 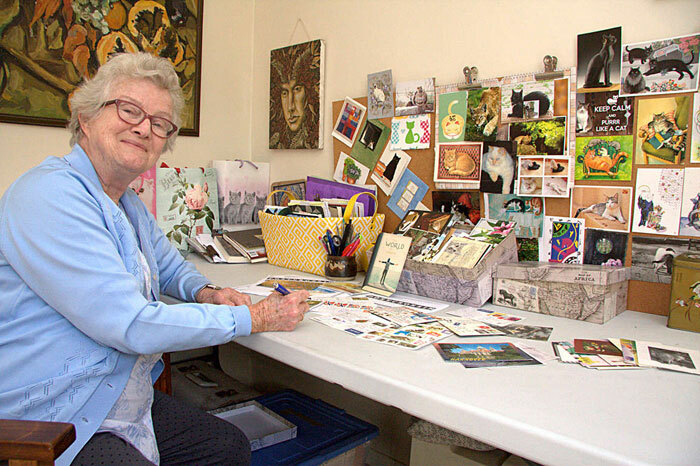 I love seeing what your office set up is and how you share your passion and excitement for postcrossing. Such a nice story! I love the idea of story cards! Cat cards are my favorite too! How lovely to visit you through this spotlight! I enjoyed reading a bit about your life. Thank you for sharing! I always love these Postcrosser Spotlights......Lovely to see and meet you, Alison! Hello Alison, greetings from Australia. I enjoyed reading about you and getting a little insight into your life. Thank you for sharing. You seem like a very lovely lady. Thank you for sharing with us, Alison, and greetings to you from Kilkenny, Ireland. Your enthusiasm is quite inspiring! May you always enjoy the best of health and continue living life to the full. All the best, Jane. Hello, greetings from Kuala Lumpur, Malaysia. Thanks for sharing the story - you have a great workshop! I want to be Alison when I grow up. Alison, you are such an inspiration! I am also in Cape Town and would love a Postcrossing get-together. Wonderful interview! I thoroughly enjoyed your story Alison and loved your love of life and energy...It's inspiring. All the very best to you. I love her ! An adorable lady ! What a wonderful story about Alison41-thank you for sharing- I wish I knew what the postcard-story-Book was?! A lovely story!! South Africa is a brilliant country and do not allow negative stories hinder you from visiting. I have been seven times and I hope one day to live their? I also know to play mah-jong! Am curious though, are there postcards about it? Great interview, I liked to read it. Очень интересная история! Надеюсь, когда-нибудь нам выпадет адрес Элисон и наш зауральский кот отправится в Южную Африку. Будем ждать и верить. Wonderful story and wonderful person! I really admire you! Lovely story. So proud of being part of such an amazing community, like Postcrossing! Hello Alison, so great to know you! Nice to read about you. In India Still Postman are coming to our door to deliver a mail. With these much year in my hobby I am still to get connected to some of the areas. And I am still trying. Amazing Story! Cat postcards are the best, indeed! Hello from Brunei. I hope one day we get to exchange postcard or letter...and i happen to love cat so much that we have 8 of these lovely furbabies domestically taken care n love..and many more strays coming over to our house and we give love if they want to..if not, they are all welcome to eat and rest wherever they feel comfortable. its really inspiring to have these hobbies. such an amazing lady, I hope to draw Alison's address one day, or maybe she'll pick me..... sometimes dreams could came true!!! Warm hugs from two paws :) ...also a cat lover too! awesome to meet you, where i used to work at the nursing home the ladies played mahjong :). i agree with you cats are lovely, i hope one day you get your post crossings meet up. I just LOVE all those cat post cards you have on display!!!!! Nice to meet you Alison. I play Mah-Jong too ! My mother teach it to me. And I’ve been teaching it to many of our friends and family. You are a very inspiring lady. Alison, I am from Pretoria. That same Ideas inspired me as well. A get together will be nice. Hi Alison, Lois and Tjoks, I'm also in Cape Town and is love it if we could arrange a meet up! Let's make a plan! Maybe send me a message through my profile and we an exchange details and set something up. Urgh sorry for the typos in my above comment. It's been a super long day. This is were South Africa's meet-ups are. You can also see a guideline about meet-ups here, if this helps you. Thank you for the interview and opening your life and your way of living to us. I was very impressed and feel grateful to know you a bit. All my best wishes to you! Love your interest in postcards, cats and reading. Three things I also like. You seem like a very interesting and active person. Stay healthy. I would love to visit S. Africa someday. Inspiration to anyone, especially retirees. It was lovely to read about your postcrossing and other hobbies. I hope you get your wish to meet up with other postcrossers in South Africa. Hello Alison, what a wonderful Spotlight interview! The photos of you seemed so familiar to me, so I looked at your Postcrossing profile. No wonder! I just received a postcard from you the other day, the one with the adorable little Sugarbird on it. Thank you again for such a lovely postcard. Oh, and I do hope that you someday get to attend a Postcrossing Meet-up. It is really a special experience to actually meet a fellow Postcrosser in person. Happiest of Postcrossings to you! Nice to hear about how started post crossing..
Hi. I've read the article and all its comments. It seems you're going to have a South Africa meet-up soon! I've never been to your country, but I once had a penpal from Johannesburg. Lyne Kaplan was her name. But it was almost 50 years ago. Now my hobbies are a few collections, some wooden craftwork, Spotify, Netflix, and travels. I hope I can visit your country someday. I'll keep my fingers crossed Postcard United will give me your address someday. Till there I'll look for a cute cat postcard for you. Have a nice day. What a surprise, Gonny is my pen friend for already some years now. I love her story cards so much! May your mailbox be continually full, and your life happy. I enjoy reading these stories about postcrossers, as well as the shortened ones (sadly without pictures) on people’s profiles. The world is so much better for being connected, and not just through social media, but old school writings with the help of the post offices around the world! I play a lot of board and card games, and some of my game group members play mah-Jong. I have yet to learn (other than the Americanized online type which is NOT the same play despite using similar tiles.) I think it’s wonderful that you play. One of my favorite things is getting to know other Postcrossers, so this blog was a favorite, too. I have only received a few postcards of South Africa, through Postcrossing, but I've had friends who have travelled to your country and tell me how amazing it is. Now I "know" more about an amazing and inspiring lady who lives there. Great photos! Hi Alison greetings from Ireland. I found your interview so interesting. Also l love your cat theme..
Hello Alison, much wishes from some tenderfoot here from germany. You are an amazing and exciting person. You are right to live your passions. This is a good topic for the blog and I look forward to hearing from other postcrossers.